Baby Rhino Warren at Baby Rhino Rescue | Adopt and Donate Now! Warren’s mother was poached on a private farm when he was only a few weeks old. 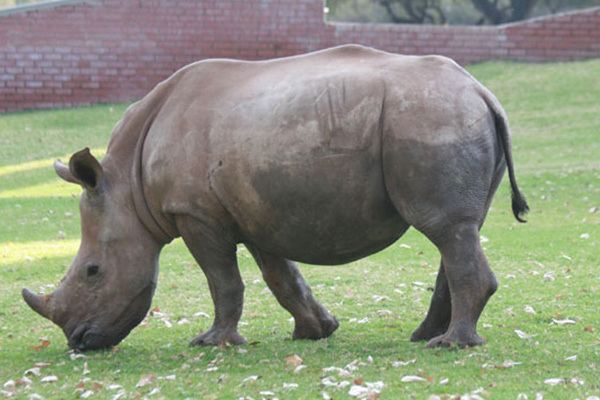 He was rehabilitated at Care for Wild, then brought across to RPF. At first he was upset and difficult, finding it hard to settle down in a new place. But with love, care, daily bottles of milk and new rhino company, Warren began to adjust. He is four years old now, and the proud alpha bull of his crash. He takes his alpha status seriously, making sure that the little rhinos (Nova and Jenny) are safe at all times! He loves nothing more than slow walks with his crash across the very green grass, grazing as he goes.